So you've got some smooth skating skills and you are ready to start scrimmaging. That's so exciting and/or terrifying. Really though it's probably a mix of both. When you first get out on the track with nine other people it can be overstimulating and overwhelming. There are so many new sounds and smells. Believe me when I say you can do this. I have six tips for you to help keep your focus and get the first few jams under your belt. 1. Always Have A Buddy. Life is so much better when you have a friend! It is also so much easier to cover the track when you have someone to help. You can brace each other during contact and you have twice as much power to hold back that jammer when you have someone to work with! 2. Communicate With Your Team. This can sound like blockers talking to jammers, jammers talking to blockers, blockers talking to each other, or it may not have a sound at all! There are lots of ways that we can communicate with our team mates. Communication is a two way street so make sure you are listening to your buddies. There should be at least one person talking in your line. Be sure to communicate things like; where the opposing jammer is, if you are reforming to the front or the back, what you’re power jam strategy is etc. Remember that communication happens on and off the track. It is good practice to talk about strategy on the bench beternal jams. This helps keep your focus with your team instead of watching the jam occurring on the track. 3. GET LOW. Seriously, this tip never gets old. Do this at every opportunity. The jamber is about to hit your line? Get low. You are initiating a block? Get low. Approaching the pack? Get low! Being low in your prepares you to be strong and ready to move. Sit into your stance with everything you do. This space comes from engaging your muscles, and helps you feel solid in your skates. 4. Keep Breathing. I honestly forget to do this one a lot. It can be very easy to get caught up in everything that is going on. 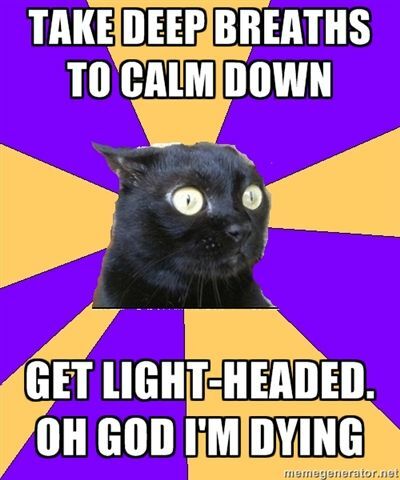 Especially for the first few times, when being in the thick of things can get overwhelming. There are a lot of things happening, a lot of people bumping around, and a lot of different noises. Staying calm is a huge asset to you and your team. Keep coming back to your centre and focus on your breath if you are getting worked up. 5. Look Behind You. 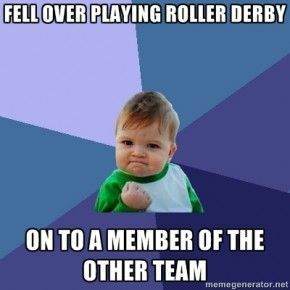 A good 80% of roller derby will be happening behind you on the track. There are few times when you should be focused on what is happening in front of you. A good line will protect their points and try to stay in front of the jammer. Jammers are known to be fast skaters and you don't want to spend all your energy chasing them down. Instead you want to spend all THEIR energy by making them have to fight past you and your team. 6. Watch More Roller Derby. This is especially true if you are having trouble finding something to focus on when in the pack. 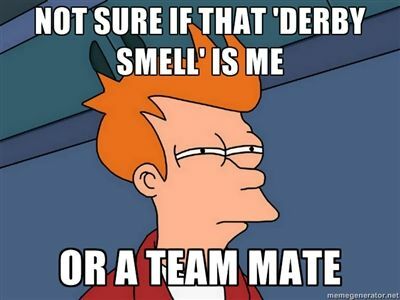 Roller derby is a fast sport and can be tricky to follow when you are first starting out. 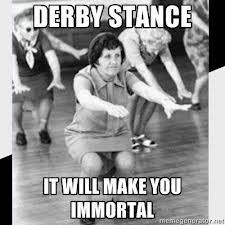 The more you watch derby, the better your eyes will become at picking things up. Watch some WFTDA games online and pick out something specific to watch. Keep you eye on the lead jammer for a bit, follow specific skaters, or you can widen your view to watch what the whole pack is up to. I like watching the referees for hand signals, then turning back the video to watch the penalty being committed (Ref nerd here). It also gives you goals to strive for. How do you know that you want to jump the apex if you have never seen someone jump the apex? All these points work for live games as well. *Bonus tip* Visualize what you are going to do before you skate. A lot of players like to take at least a few moments in the change room to themselves before a bout. Take some deep breaths and think about all the awesome things you will do in your bout. Focus on the things you know and the things you can do. Set some goals for yourself and create a calm, confident head space that you can come back to during the game. TRUST yourself and your team! You will be fantastic. My hope is that these tips will help to calm your nerves when you begin scrimmaging for the first time. It always helps me to feel prepared when I am doing something new. You don't have to remember ALL these tips all at once, but I hope some of them will help get you where you want to be. We learn the MOST during a scrimmage as opposed to individual skills training. Keep in mind that above all else this is a learning experience so be sure to enjoy yourself while you do it! If you would like to suggest a blog post please email us at info.coffinskateco@gmail.com or leave a comment below. We would love to hear from you and help answer your skating questions.